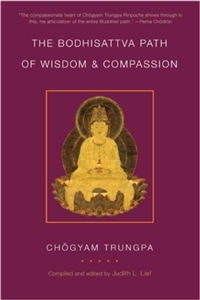 The Bodhisattva Path of Wisdom and Compassion, presents the bodhisattva teachings of the mahayana. Mahayana practitioners dedicate themselves to the service of all sentient beings, aspiring to save them from sorrow and confusion, and vowing to bring them to perfect liberation. This stage of the path emphasizes the cultivation of wisdom through the view and experience of emptiness, or shunyata, in which all phenomena are seen to be unbounded, completely open, ungraspable, and profound. From the ground of shunyata, compassionate activity is said to arise naturally and spontaneously. In addition to mindfulness and awareness, the mahayanist practices lojong, or "mind training," based on the cultivation of the paramitas, or "transcendent virtues": generosity, discipline, patience, exertion, meditation, and prajna, or "knowledge."